Amadou Toumani Toure, ousted as Mali's leader in last month's coup, has fled to neighbouring Senegal, even though many of his allies have been freed. Mr Toure arrived with "his entire family" of about 15 people, a Senegalese official said. He had been in hiding but earlier this week it was revealed that he was in the Senegalese embassy in Mali. Journalist Martin Vogl says the nighttime escape is a sad end for a man seen as a great African statesman. He was hailed for ending years of military rule and handing power to civilians after organising elections in 1992. Ten years later, he was elected to power himself. Although the military junta has formally handed over power to a civilian, earlier this week it arrested 22 senior officials - including many allies of Mr Toure. They were released late on Thursday night but Martin Vogl told the BBC's Network Africa programme that Mr Toure had obviously thought it prudent to get as far away as possible from Mali's soldiers, who have previously threatened to arrest Mr Toure. Martin Vogl says the arrests seemed to have been intended to intimidate politicians and the population and show that the junta remained a force in the country. 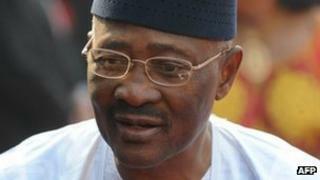 Mr Toure formally resigned on April 8, as part of a deal for the soldiers to hand back power. Mali's interim leaders, President Dioncounda Traore and Prime Minister Cheick Modibo Diarra, have the task of organising elections and ending the northern rebellion. The military said it had seized power because Mr Toure's government had not done enough to combat rebels. But since the coup, the rebels - an alliance of ethnic Tuareg separatists and Islamists - have taken control of the whole northern desert region. On Thursday, medical charity Medecins Sans Frontieres said there had been a huge rise in people fleeing the region and that more aid was urgently needed to help those fleeing to neighbouring Mauritania.